Sometimes, I just don’t get you internet people. You seem to obsess over the most random things, from discontinued Szechuan sauce from McDonald’s, to a slain gorilla called Harambe, but none more random than the completely out-of-nowhere fascination for a cartoon based on a line of girls’ toys. The extreme fandom surrounding My Little Pony over the last few years, specifically the rebooted cartoon series known as Friendship Is Magic, is baffling to say the least, not least because a majority of its fans aren’t even its target audience; they largely consist of much older male fans who call themselves “bronies”, and obsess over the show to a point where they even have their own conventions dedicated to it. It’s strange to see this much passion be poured into something that’s otherwise designed solely to promote the product, but like with most fandoms – even the most out-there ones – I am fine with them being passionate about whatever they want, as long as it doesn’t hurt anybody else. Naturally, having never sat down to watch this show, and with only the faintest of memories from childhood about the basic crux of My Little Pony, with a feature film coming out I simply had to see what all the fuss was about… and from this movie alone, it’s easy to see its appeal, but I personally wouldn’t ever willingly sit during it ever again unless I had very little kids to look after. I’m going to have a go at describing the plot without any knowledge of this show’s history or characters (mainly because I’m not too familiar, but also because I want to see how many “bronies” I can irritate with my vague descriptions! ); so, there’s this kingdom populated by ponies, some can fly, others can’t, it’s a weird hierarchy. Anyway, there’s this purple princess pony who’s putting together a festival with her friends, but then their kingdom gets invaded by an evil pony (voiced by Emily Blunt in one of many special guest appearances), and so they must go on this quest to save their home, along the way coming across many characters that I’m guessing weren’t in the show, but I’m not entirely sure. Either way, it’s as basic a kid’s film plot as you can get. As someone who is clearly not the target audience for this, I found it to be mostly serviceable, and harmless enough to put your kids in front of for an hour and a bit (I’d much rather a child watch something like this than The Emoji Movie or Norm of the North). The animation, which seems to blend 2D drawings with 3D backgrounds, is colourful and pleasant to look at, the songs – oh yeah, it’s also a musical – are incredibly cheesy but for this kind of movie are just par for the course, and while it’s not overtly funny there are one or two amusing moments, most of them coming from the way these ponies are drawn in certain scenes. There’s plenty for young children to be engrossed by, but outside of that I have no idea who would really find this to be wholesome entertainment; I can’t even speak for the huge fanbase for the show this is based on, because I don’t know that many who watch it nor do I have any idea what the community feels about this film already. Look, I’m really not the best person to be talking about this; I’ve not seen the show or really any material inspired by the My Little Pony brand, and while I don’t identify as a “brony” I pay no mind to anyone that is (again, unless it’s causing anyone else harm), so I can’t offer any real insight into this franchise nor can I give a thorough analysis on how it fits within the continuity etc. All I can do is review this as a movie first and foremost, and with that in mind this film is perfectly okay. It’s purely for children, and in terms of morals and characters there are some decent things for them to take away from this, but not so much for any unfamiliar adults in the audiences; they will feel like how my father ever did when I asked him to take me to a Pokémon movie, bored senseless and counting down the minutes until this thing that your offspring enjoys is over. I will probably never understand the My Little Pony fandom, nor its alarmingly large collection of male adult fans, but based purely on seeing this film I can understand why someone would find this pretty charming. Personally, it’s not really my thing, but that shouldn’t stop others from enjoying it just fine. 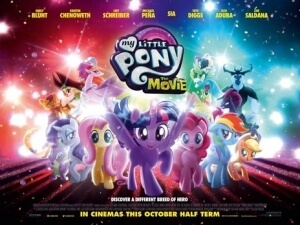 My Little Pony: The Movie will no doubt please young fans of the cartoon show – as well as the alarming amount of male adult “bronies” this fanbase contains – but for outsiders, this is unlikely to convert you even with its perfectly harmless nature.